I reached both THE END and 50k. So by the terms of the challenge, I win! But I had my own terms, and they were less successful. I dreamed of finding a way to sit down to do the writing more easily this month, and that didn’t really happen. At all. I secretly hoped — who wouldn’t? — that the finished novel would be tolerable. That didn’t really happen, either. At all. But oh, geeze, did I ever learn stuff. 1) The brainmeats don’t work very well if the bodymeats are under-slept, poorly fed, under-exercised, and sick. Of course not. It’s easy to forget that brainmeats are just another kind of meat. I need to build a much stronger physical foundation to support the writing. 2) Shiva nata is amazing for writing. I already knew that, but had further proof in the eleventy billion words we wrote after each of my Shiva NaNo classes. It was incredible. 3) I work best with companionship. 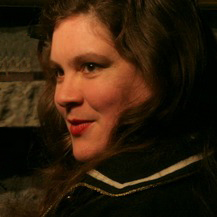 Many thanks to E. Catherine Tobler, who did countless 15-minute sprints with me, helped with tangled or non-existent plot points, and urged me to keep trudging. 4) Speaking of trudging. . . you have to keep trudging, no matter what. This novel refused to behave well. My very solid outline went to hell by the end of the first day. I threw away 5000 words of a lifeless start and tried again. I pretty much gave up halfway through and started killing off characters just to get their insipid dialog out of my life. It was all very, very bad. But I kept trudging, despite the obvious pointlessness, and much to my surprise, over and over again, I found little treasures. A bit of plot that made sense. A bit of decent characterization. A resonant theme. I can’t just think up decent stuff; I have to write my way into it. And that means I have to write. Even if it’s stupid. Even if I hate it. Even if it’s total crap. 5) Not all good stories are mine to write. I had some great material to work with here — 1930s! Feminism! Aviation! Ecology! A panoply of monsters from myth and legend! But when it came down to it, it wasn’t the story of my heart. So I need to be more aware of what my heart wants to do, and more nimble at getting back to my heart when I go astray. 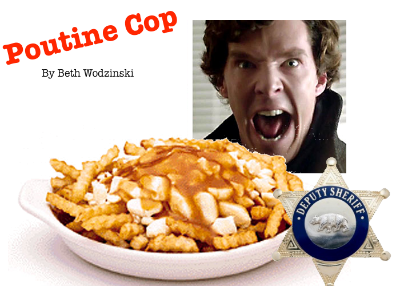 And if my heart really wants to write the completely ridiculous noir parody Poutine Cop? Well, then, it’ll be a magnificent lesson in learning to trust my heart. 6) Best of all: somehow, despite the brutal slog, despite all the things that were awful, I came out of November more deeply engaged with writing than I have been for a long time. This project didn’t work, but I’m very eager to find another project that does work.